At its homecoming game Saturday, the university became one of the first in the country to offer "sensory bags" to attendees who need them. The roar of the crowd, the music of the marching band and the amplified voice of the game announcer are hallmarks of college sports games. Yet all that commotion can be overwhelming to people with autism and others with sensory-related sensitivities. “It was preventing people from coming to games,” said Shawn Heilbron, athletic director at Stony Brook University. Beginning with Saturday night’s homecoming football game against the University of Rhode Island at LaValle Stadium, Stony Brook began offering “sensory bags” to fans with sensory needs. The bags, which are filled with noise-canceling headphones, a “fidget ball” to relieve anxiety, a card that can help express emotions or needs, and other items, also will be available at basketball games. In addition, 83 security guards and others who work at sports events underwent training on how to interact with people with autism, post-traumatic stress disorder, Down syndrome, dementia and others who may have difficulty handling the stimulation of a football or basketball game. Stony Brook is one of the first colleges or universities in the country with such a program, said Uma Srivastava, chief operating officer of the Alabama-based nonprofit KultureCity, which works to increase acceptance and integration of people with autism. The introduction of sensory bags Saturday came during homecoming festivities that included the inauguration of the university's first gender-neutral homecoming court, with three "homecoming royals" instead of a king and a queen. The winners were Ian Lesnick, RJ Samodal and Jules Zambito. 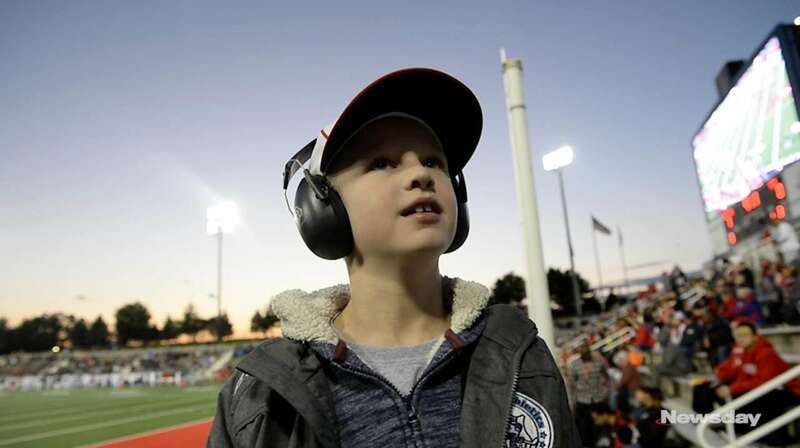 Tommy Palamara, 8, of Setauket, has sensory processing issues, loves sports and regularly attends Stony Brook football and professional sports games, said his mother, Libby Palamara, as the family arrived at LaValle Stadium. But he doesn’t like the noise. Libby and her husband, Tom Palamara, usually bring headphones, but they forgot them at home. They were grateful to see the sensory bags near a stadium gate. “The fact we have this as a backup is tremendous,” Libby Palamara said. Tommy said that other times when he didn’t have headphones, he has had to cover his ears. As rock music blared from the speakers before the Stony Brook players took the field and the crowd cheered loudly, Tommy was smiling and hanging out with his buddies in the stands. Without headphones, he would have gotten anxious, his mother said. The Stony Brook Seawolves went on to defeat the Rhode Island Rams, 52-14. The idea for the sensory bags at Stony Brook came from Antony Bonavita, a Stony Brook graduate and senior vice president for the Cleveland Cavaliers, which in early 2017 became the first NBA team to offer a program for people with sensory needs. Now, 17 of the 30 NBA teams work with KultureCity on sensory-needs programs, Srivastava said. Bonavita approached the university earlier this year and offered — with his wife and fellow Stony Brook graduate Jaclyn Bonavita — to pay for five years of sensory-needs training and sensory bags at Stony Brook. Antony Bonavita is the father of an 8-year-old boy with autism, so he knows the importance of not allowing sensory sensitivities to limit people’s opportunities. “It gives me great hope to know my son will be able to experience the world the same way you can, and anyone else can,” he said. Stony Brook is the fourth U.S. university to earn the title “sensory inclusive” from KultureCity, Srivastava said. The designation is for programs that integrate people with sensory needs into the general community. Adelphi University in Garden City is one of the other three. The university does not offer sensory bags at sporting events, a spokesman said. But it has a “sensory room” for people with sensory sensitivities to retreat to if they feel overstimulated, and it has special academic and career counseling and other services. The online training from KultureCity that Stony Brook staffers and contract employees received showed them how to react to scenarios involving people with sensory sensitivities. Three weeks ago, Nikki Fogarty was working security during a Stony Brook football game when a boy of about 10 who appeared to be autistic panicked when he became separated from his father. “He was starting to shake and scream and hit himself," Fogarty recalled. Fogarty, 21, a Stony Brook student who works full time assisting people with developmental disabilities, squatted to the boy’s level, took his hand and asked him to breathe deeply. After calming him down, she radioed a description of the father to other staffers. Not knowing how to interact with someone with autism can make a bad situation worse, so the KultureCity training is invaluable in preparing stadium personnel to assist fans with sensory needs, she said. Heilbron, the athletic director, said the training and sensory bags are meant to make all feel included. “We want to make sure everyone can come to our games,” he said.